He was a retailing whiz kid at 20, a multi-millionaire at 25, a management guru at 30 and a fine art broker at 35. It hasn't always been that easy though. He lost half his wealth in the stock market crash of 1987 - an event that pushed him toward the world of offshore investment. Today, he is one of the world's top offshore hedge fund entrepreneurs. Meet Dion R. Friedland, a self-made international entrepreneur with an uncanny knack for re-inventing himself. 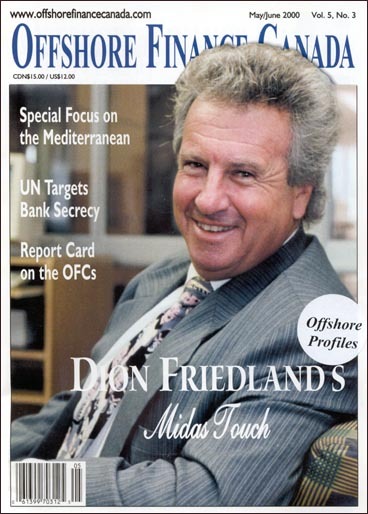 Normally you might be forgiven for thinking someone like Dion Friedland - whose amazingly successful career in retailing, consulting and offshore investment has spanned 40 years and five continents - would be ready for early retirement. Many people, after all, envisage enjoying the fruits of their labor on some tropical island paradise. And South African-born Friedland does own one of the world's foremost luxury resorts, Cap Juluca, located on the stunning sun-drenched beaches of Anguilla in the Caribbean. He's just too busy to spend any time there. Too busy starting a new online sports merchandising company with former superstars Hank Aaron and Jimmy Connors. Too busy personally managing his two new Internet and e-commerce-oriented hedge funds. Too busy jetting off to New Delhi, India for a meeting of elite world presidents. 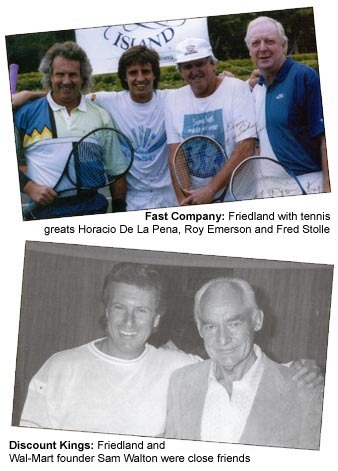 Too busy playing a grudge match against his good friend, Australian Fred Stolle, the number-one tennis player in the world in 1965 - unless, of course, it's to play Roy Emerson, who still holds the world record for the most Grand Slam singles tennis tournament victories. He is definitely not too busy to stay in shape, though. At age 57, the energetic and muscular Friedland still often starts the day pushing weights in the gym. "I'm trying to regain the body I had as a teenager," dead-pans the five-foot-ten-inch Friedland. He still sports a solid physique reminiscent of the days when, as a young man, he dreamt of becoming South Africa's premier body-builder. 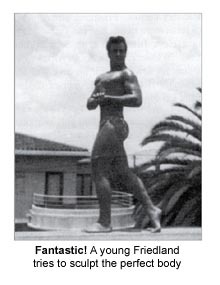 Friedland admits he was obsessed with sculpting the perfect body while still a psychology student at the University of Witwatersrand in South Africa in the 1960's. The venture came to an abrupt end when Friedland, ever the realist, recognized he was simply bodybuilding as a means of attracting attention. Actually, Friedland did retire once in 1969, a multi-millionaire at the age of 25, when he sold his innovative string of Rave discount hard goods (furniture and appliances) stores in South Africa to one of the country's largest retail chains. But that was a long time ago, back when he was known as the "retailing whiz kid of South Africa." It took Friedland a lot longer to triumph in the luxury resort business. The dramatic Cap Juluca saga is a testament to Friedland's tenacity. The story started in the eighties when a friend showed him the dazzling but empty Anguillan beach where the unique resort now stands. Friedland was non-committal until the friend whisked him into the office of the island's minister of tourism and grandly announced that "this gentleman, Mr. Friedland, would like to develop a resort here." The surprised Friedland took the bait and began the project, but sold out shortly thereafter to a group of New York-based investors. The Americans went ahead and built the resort-with luxury villas modeled on Friedland's original concept of a Moorish fantasy theme-but omitted to pay Friedland the nearly US$1 million for his rights. These days Friedland is keeping himself busy staying on top of the latest investment trends. A consummate offshore investor and occasional venture capitalist, Friedland easily switches hats whenever an exciting new business opportunity arises. This is a man driven by new challenges; and when he sinks his teeth into a project, he won't let go until he comes out on top. A self-taught investor, it took him only five years to build up one of the world's most successful offshore hedge fund management companies, Magnum Fund Management Ltd. located in Nassau, Bahamas. Magnum was named Best Offshore Hedge Fund Manager for 1998 by the acclaimed Standard & Poor's Micropal fund rating service. After completing a BA in psychology, Friedland studied law, and actually contemplated following in his father's footsteps as a lawyer until he unwittingly stumbled onto his true vocation -concocting strategy and starting new businesses. His rise to retailing prominence began innocently enough when he organized a network of 20 students to help sell discounted clothing on campus. At age 20, having accumulated a thousand dollars, he opened up the first Rave Discount Store in 1963 and changed the face of South African retailing forever. From the very beginning of his business career, Friedland wreaked havoc among the competition with a remarkable sense of timing and a willingness to seize the moment. In 1965, with three stores to his name, he quit law school at the age of 22 and engineered a classic reverse takeover of Norman Anstey Ltd.- a declining, old-guard chain of 12 department stores that nevertheless had a book value of about US$3 million. It also had a value 10 times the net worth of Friedland's tiny chain, but Friedland ended up with 80% of the shares of the new merged company. A scant 18 months later, Friedland sold his holdings - by then totalling 18 stores-to Greaterman's, a major retailer, for US$3 million. "People would drive a hundred miles to shop at my stores because we had such a great image," recalls Friedland. "We kept costs down because we didn't provide credit, and we offered a free bottle of champagne if you found a better price somewhere else." The next year, capitalizing on his growing fame, the restless Friedland opened Dion Discount Stores and eventually bought back the Rave stores in 1978 from the beleaguered Greaterman's for next to nothing. When he finally unloaded it for good in 1985 at a price of US$25 million, Dion Discount Stores had become the dominant hard goods retailer in South Africa. The chain had prime real estate in the country and the largest retail store in downtown Johannesburg. Wal-Mart stores. Walton came to South Africa to visit Dion stores in 1985, looking for new ideas for his own Wal-Mart chain. When Walton, by then the richest man in America, died in 1992, Friedland attended the US funeral. Friedland's 'whiz kid' reputation convinced Dayton-Hudson Corp., at the time one of the largest and most professionally-run retail groups in the US, to recruit him in 1973. Dayton-Hudson executives thought they had scored a coup, but Friedland, a newly-minted vice president at the tender age of 30, ran circles around them. It took him only six days to map out a new development strategy based on increased specialization for the company's booming Lechmere stores in Boston. Company executives were shocked, claiming the job couldn't possibly be done in less than six months, and urged him to tone down his brash style. "It was a challenge," says Friedland. "I wanted to prove to myself that I could be a professional manager and run my South African business from a distance. I also wanted to find out how the big US retailers made such consistent profits using professional managers instead of entrepreneurs," he says. Although not needing to, Friedland agreed to wait six months before submitting his report. With nothing better to do on weekends, he criss-crossed the lively streets of New York buying art and decided to open an art wholesale business, called Friedland Art Inc. The staid, slow-moving world of international fine art was not made for the dynamic entrepreneur. Disappointed with the glacial speed of the industry, Friedland eventually transferred his art business to his daughter, Lara Block, who now lives in Miami, Florida. With no more challenges to overcome, and with his wife Hilary begging him to return to a more civilized lifestyle, Friedland left Dayton-Hudson after only 17 months on the job. Perhaps that's not surprising coming from a man whose corporate motto in the heyday of his South African retail empire was "Do It Now," a motto reminiscent of Nike's famous "Just Do It." Not content with just doing it, Friedland has always expected his employees and business associates to do it now, and to do it better, too. "I'm a perfectionist," he says. "I can't tolerate mistakes." An early supporter of total quality before it became fashionable, Friedland still spends countless hours personally copy-editing his own Magnum Funds newsletters, the Magnum Fund Alert and the Magnum Hedge Fund Reporter, to make sure all the i's are dotted and the t's crossed. A thirst for better sales results led Friedland to start Mandev in 1976, one of the world's first sales training consulting companies to use the newly-developed technique of behavior modeling. Revolutionary at the time, behavior modeling did away with the traditional motivational speeches and show-and-tell videos to focus on building up specific sales behavior through practical training, followed by constant positive re-inforcement. "I had the same problem as a lot of other retailers-my salespeople couldn't sell, they were just simply order takers," says Friedland. He originally launched Mandev to increase sales in his Dion Discount Stores. But like almost everything he initiates, it eventually turned into a full-fledged business of its own. Mandev's clients included an international who's who of retailers and the larger business world - Macy's, Bloomingdale's, the trendy Galeries Lafayette in Paris, Ford, Toyota, John Deere and BMW. Mandev became the biggest retail sales training organization in he world, with offices in Europe, Canada, the US, Australia, Brazil and South Africa. Canadian clients included top men's wear retailers such as Harry Rosen, and Tip Top Tailors. By the time he moved to America, Friedland had abandoned his South African residency and relocated his businesses offshore, to Nassau, Bahamas. The decision was basically economic rather than political, stemming from his desire to get around onerous South African exchange controls that prevented residents from taking any money out of the country. "I wanted to be a global citizen," he says. "Once I had seen the world, I didn't want to go back to the farm." Like every other business venture Friedland had undertaken, the investment fund business just sort of happened - something whose time had simply come. 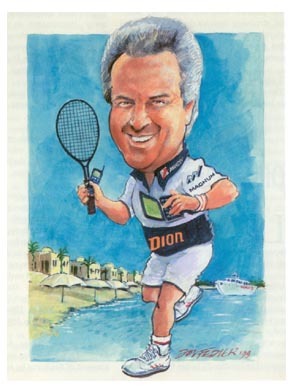 After he sold Dion Discount Stores in 1985, Friedland began investing in stocks and mutual funds. Severely burned by the stock market crash of 1987, he switched over to hedge funds and his investment portfolio grew spectacularly. A Coopers & Lybrand report in 1994 confirms that US$100,000 invested in Friedland's hedge fund portfolio in 1988 would have been worth over US$l million only six years later, equivalent to a whopping 47% average annual compound return. Word got around and pretty soon Friedland's friends were sending him money to invest on their behalf. When his accountants complained there were too many investments to keep track of, Friedland took the plunge and started up Magnum Funds. Perennially on the lookout for new opportunities, Friedland just couldn't resist a new challenge. If there's one thing guaranteed to get his hackles up, it's someone complaining that "it can't be done." "I've fired more people in retailing for saying that than any other reason," says Friedland, displaying the broad smile which is never far from his lips. If he does get involved in a venture, Friedland expects superior performance. "I can be tough to live with - just ask my family what they went through - but it works," he says. Superior performance is exactly what Magnum strives to deliver. Magnum had the best-performing hedge fund of funds in the world for each of the past three years as ranked by Standard & Poor's Micropal: Magnum Tech Fund (up 113% in 1999 and 55% in 1998) and Magnum Opportunity Fund (up 55% in 1997). Unlike regular hedge funds, Magnum's funds of funds allocate investments among a spread of funds run by leading specialists in each area. In other words, they hold other funds instead of individual securities in their portfolios. This blending of different strategies and asset classes aims to provide a more stable long-term investment return than any of the individual funds. Consistency is what separates Magnum from other hedge fund companies. It had a whopping 11 of the top 12 best-performing hedge funds of funds in 1999, the top 12 for the last two years, the top nine for the past three years and three of the top eight funds of funds for the last five years, as rated by S&P Micropal. To achieve consistently superior returns, Friedland developed an approach to selecting fund managers which differentiates Magnum from the rest of the hedge fund industry. He contemptuously dismisses the traditional industry emphasis on quantitative historical returns as a way of selecting fund managers, pointing out that Magnum would have missed out on some of its best managers that way. Instead, Magnum looks for managers who appear to have an edge - for example, access to superior research or information flows, better analytical skills or better contacts in the industry, on Wall Street or with investors. "The underlying theme for all our investments is to focus on qualitative issues," says Friedland. He credits his conversion to a meeting early in 1995 in New York with Raj Rajaratnam, former president of the brokerage house Needham & Co. and now manager of the high-flying Galleon Omni Technology Fund, administered and marketed (but not managed) by Magnum. At the time Friedland, who had just launched Magnum Funds in April 1994 with about US$10 million of his own money and another US$4 million belonging to friends and associates, was desperately looking for advice. His foray into the little-known world of hedge funds was a disaster and Magnum was actually losing money after its first nine months of operation. "It was a terrible beginning," recalls Friedland. "I knew we were doing something wrong, but I didn't know what it was." The meeting with Rajaratnam, who was managing a US limited partnership at the time, opened Friedland's eyes. He realized that Rajaratnam's edge was due to superior information flow - 92 of the 99 investors in his limited partnership were CEO's or senior managers in high-tech companies, many of which Needham had taken public in previous years. When Friedland ran his discount retail chain of in South Africa, he decimated the competition by guaranteeing his customers lower prices, better selection and vastly better service, and he delivered. Now, armed with new insight from both Rajaratnam and his own retail experience, he decided to put his theory to work. Five short years later, Magnum's results speak volumes. Savvy investors will exploit the differences between regular mutual funds and hedge funds. Regular mutual funds are tied to the markets - their performance is measured relative to key market indices. They often have narrow investment policies and function under restrictive securities legislation. Hedge funds, on the other hand, strive for absolute returns regardless of whether the market is going up or down. Hedge fund managers can use more flexible investment strategies such as arbitrage and make heavy use of short selling. They have a low correlation with traditional asset classes, which means less risk, and they offer good diversification because they typically outperform in a hostile market. As a result, they attract the top talent in fund management. Hedge funds are for sophisticated investors who understand the very real dangers of a prolonged bear market. For example, anyone who invested heavily in Japanese mutual funds before the crash of 1989 would still be in the red today - 11 years later. Friedland points out that stock markets can take up to 25 years to recover from a major correction, and that's without taking inflation into account. Experiences like the Japanese correction or the infamous crash of the Dow Jones in 1929 leave deep psychological scars, essentially destroying a whole generation of investors. "It's fine to look at mutual funds at the end of what is essentially a 10-year bull market," says Friedland, "but you don't really have any protection in a mutual fund. So the hedge fund is your insurance." "Betting all your investments on a perennial bull market is like driving with no brakes - it's great as long as you're going uphill, but what happens when the road starts heading downhill?" asks Friedland. The world's top hedge fund entrepreneur speaks from experience. He lost approximately half his net worth - his holdings at the time were worth "substantially more than US$15 million"-in the stock market bloodbath of 1987. Primarily invested in stocks and mutual funds, many of them heavily leveraged, he watched the vast majority of his assets plummet in value as he desperately strove to liquidate his holdings. However, the canny Friedland noticed that his small holdings of Quantum hedge fund shares that he bought in 1985 dropped considerably less. "I immediately understood what happened. From then on I only invested in hedge funds," says Friedland. Although he doesn't think another major correction is imminent, Friedland still worries that investment trends such as a lack of true portfolio diversification and the increasing correlation of world markets are leaving investors more exposed and vulnerable than ever before. Investors willing to read between the lines already know some of the sobering statistics. For example, 70% of equities in the critical US market actually went down in 1999, and a concentrated mix of only 24 big-cap companies, many of them in the technology sector, accounted for much of the growth in the S&P index. The situation in Canada is very similar, with several high-tech firms such as Nortel Networks accounting for a disproportionate amount of the country's stock market capitalization. Ironically, the very global economy so beloved by free trade enthusiasts is making true diversification of investment portfolios more and more difficult. For example, many companies in the "gang of 24" appear regularly in a variety of offshore investment portfolios, be it global funds, tech funds and the like. Nobody is suggesting that the tech bubble is about to burst, however. Friedland says technology is in a period of accelerated growth that will continue to provide a long-term bull run. This is especially true of telecommunications and technology providers. These companies are booming as the Internet, e-commerce and wireless revolution sweeps the world. But fund managers will have to exhibit a strong sense of discipline to focus their investments. An inveterate workaholic who sleeps only three to five hours a day, Friedland has no trouble keeping abreast of new trends. Currently, that means investments in online shopping and business-to-business e-commerce. Friedland says consumers are on the verge of accepting e-commerce on a massive scale, and that means many shopping malls could go the way of the dodo bird. Major banks and credit card companies in the US are introducing digital signature technology, and consumers are responding favorably. "I see a tremendous transfer of shopping activities to the Internet, and I think that in 10 years the Internet is going to severely erode the position of the smaller malls and shopping centers," says Friedland. He responded by wading into the Internet, e- commerce and high-tech IPO arena with a vengeance. He recently set up and is personally managing two new funds - the e-Corn Growth Fund and the Primo Capital Growth Fund - to take advantage of the exponential international growth of Internet use beyond the US into Europe, Asia and Africa. The e-Com Growth Fund will focus on emerging growth public e-commerce companies and IPOs, while the Primo Capital Growth Fund will specialize in expansion-stage private companies in the information and technology sectors that are expected to go public shortly. Jupiter Communications, a specialized international Internet research firm, estimates that the number of Web users around the world will grow from approximately 87 million in 1997 to 250 million by the end of 2002. To succeed as a fund manager, Friedland will need his own personal edge. The two funds are off to a roaring start - the e-Com fund was up 45% and the Primo fund 85% by the end of February - and Friedland credits his own personal network of high-level business contacts for that edge. Some of the best sources come from his membership in the World Presidents Organization and the Chief Executives Organization, where he receives a "never-ending flow of information" from international bankers, brokers, technology executives and politicians. "It's the best university in the world - and now they all invest in my funds," he says only half-jokingly. He also relies on close contacts with leading firms such as Global Investment Research Inc., Zulauf Asset Management AG and CrossBorder Capital. Magnum currently operates 17 offshore funds of funds requiring a minimum US$100,000 investment. In addition, the firm runs four advisor funds aimed at financial intermediaries - where the minimum investment is only US$10,000 - and two US limited partnerships for US persons. However, Magnum's core business is rapidly changing to customizing portfolios of private label funds for institutional investors such as pension funds, banks, brokers and wealthy individuals. "There's a huge number of private label clients coming - this will become the biggest part of the business," says Friedland. Magnum currently has US$600 million invested in its funds, and Friedland expects that number to grow to US$1.5 billion or more by year's end. He says the company is based in Nassau because North American investors prefer an offshore location for asset protection reasons and also because of the convenient geographical and time zones. On a personal level, Friedland chose Nassau specifically because he wanted to do business with MeesPierson, one of the biggest offshore hedge fund administrators and a subsidiary of Belgian insurance and banking conglomerate Fortis. 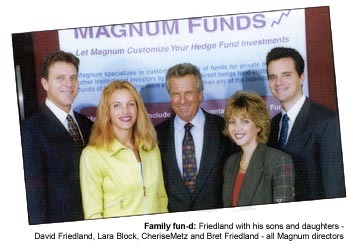 Meanwhile, Friedland's son Brett runs the research arm of Magnum US Investments Inc., with a staff of 13 full-time professionals, in Miami. The Miami office is a family affair, with Friedland's other son David filling the role of marketing director and daughter Cherise Metz in charge of finance and administration. Daughter Lara Block oversees public relations and the Magnum Web site as well as several million dollars in fine art assets held by Friedland Art Inc.
Not content to watch companies grow from the sidelines, Friedland has delved directly into the venture capital game. He owns a major stake in Netactive, one of South Africa's original Internet service providers, as well as Globalnet Financial.com, a public US company developing financial Web sites worldwide. Globalnet has entered into a joint venture agreement with First Marathon Inc., a leading Canadian investment firm, to develop an online trading business and financial Web site called Canada-iNvest.com covering Canada's investment market. To cement the deal, First Marathon made a US$2.5 million strategic equity investment in GlobalNet. As well, Friedland has gone back to his merchandise retailing roots, albeit with a high-tech twist. The latest venture involves top guns Joe Antonini, former CEO of K-Mart, Hank Aaron (yes, the Hank Aaron who holds the record for most career home runs in baseball) and former US tennis superstar Jimmy Connors. This quartet of high achievers have teamed up with entrepreneur Gary Mansfield to form an online sports merchandising company which plans to give already established sports e-tailers a run for their money. The new company is called sneakers.com. Friedland also sits on the board of a new European business-to-business electronic auction site called eurosurplus.com, which will operate in four languages. 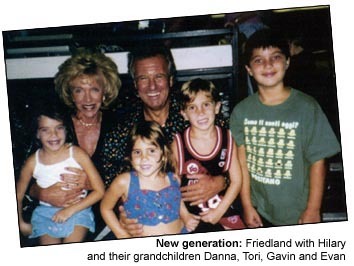 Now entering his fifth decade of business, the indefatigable Friedland just won't quit. "I know so many people with outstanding talent looking for seed investment and guidance.' The phone never stops ringing. I'm like a one-man investment bank," he laughs. Paul Zaleski is a reporter and the profiles and assignment editor for Offshore Finance Canada magazine.